Check your squash plants for powdery mildew & cut out infected leaves before it spreads. If you have an asparagus patch, keep an eye out for the highly destructive asparagus beetle starting early in summer (if not sooner). Now that we have a thriving asparagus patch, our garden has exactly what this annoying pest most desires. The seed pods are beginning to ripen on the tall, feathery plant fronds. And, that’s exactly where these beetles prefer to lay their eggs. 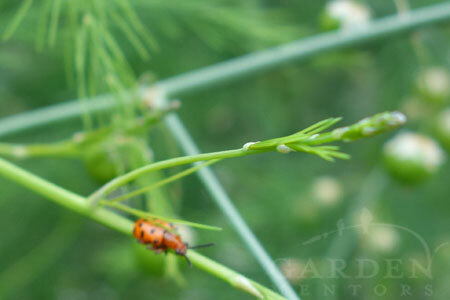 Adult Spotted Asparagus Beetles are orange-red with black spots. They appear around the time asparagus seed pods begin to ripen. 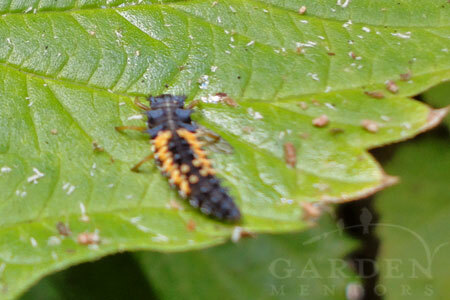 Fortunately, we haven’t had many of these pest insects yet this season. Still, we’re checking the plants carefully each day and squishing any adults chewing stems and looking for lovers. They’re tiny, but it’s hard to miss those bright orange-red forms against the green of the stems. They’ll be a little harder to spot when the seed pods ripen to orange-red, so watching early is key. If you’re on squishing patrol, take care to put one hand under the beetle and use the other one to squish with a quick pinch. Otherwise, these little critters will sense you coming, scurry to the underside of the branch, and then drop to the ground where you’ll never find them. If your hand is underneath, you’ll catch them before they fall. Adult Asparagus Beetle (Crioceris duodecimpunctata) chew on plant stems while they hang out looking for a mate. After mating, they will deposit eggs on or near Asparagus seed pods. Be sure you know what to look for. The Spotted Asparagus Beetle, which is what we have and is shown above, looks a lot like the beneficial Lady Beetle (aka LadyBug), which is shown below. How to tell them apart? The Lady Beetle is dome shaped and usually a deep, blood red. The Spotted Asparagus Beetle is more elongated than dome shaped, has a distinct set of dark antennae, and they’re more orange-red than blood red. 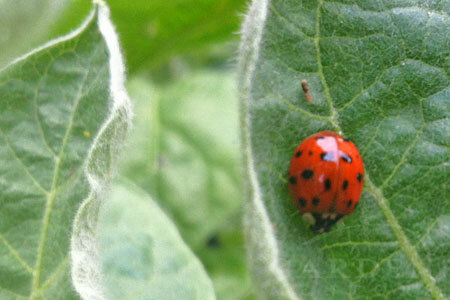 The blood-red, dome-shaped Lady Beetle is a beneficial insect that will prey on Asparagus Beetle for you. Take care not to mistake them for the pests. 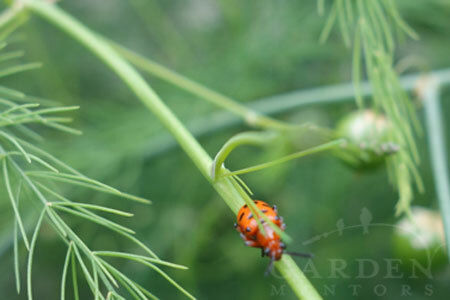 We’ve noticed the Lady Beetles and their larvae are spending a lot of time cruising through the asparagus fronds as well. They’re known predators of this pest, so we’re hoping they’re getting a belly full and keeping our patch free and clear of any eggs the adults may lay. If the Lady Beetles and our squishing isn’t enough, hopefully the hovering parasitic wasps will inject their predatory eggs into any newly laid eggs Asparagus Beetle eggs that the rest of us miss. And, of course, our resident fledgling wrens and chickadees are also on patrol — hopefully eating more Asparagus Beetles than Lady Beetles! Beneficial Lady Beetle Larvae, known as “Aphid Lions”, scurry among plants eating up unwanted pest insects like Asparagus Beetle. These “lions” may look scary, but don’t kill them. They’re good for your garden! No need for a spray bottle when your habitat is well balanced! Of course, we will be cleaning up the fronds and seeds at the end of the season just in case they harbor any eggs and larvae that slipped past our various Asparagus Beetle predators during the growing season. For more information on cultivating an asparagus patch of your own, ready our guide. Keep a gardening library? These titles are great garden insect reference manuals. For further reading on Asparagus Beetle check Mother Earth News here. They cover more than the Spotted Asparagus Beetle we’re battling.